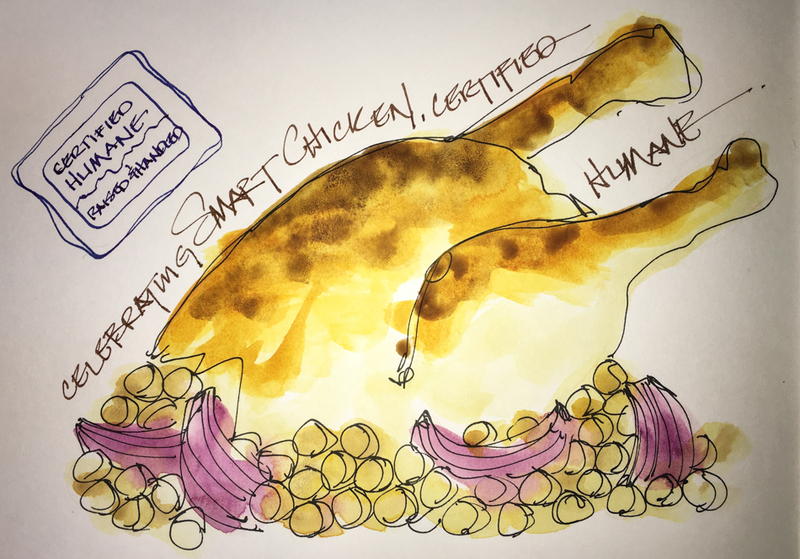 Smart Chicken is the first chicken available nationally (to my awareness, and please inform) that is Certified Humane®, and 100% of Niman Ranch’s meats – Pork, Beef, Lamb, and Processed Products like bacon – are Certified Humane®! I’m sorry we need such a program, but we do. Certified Humane® governs the way the meat is raised, and it is a great program which is all about making sure the animals are treated humanely. how disappointed we were in what was available has impact. sale — freeze — or occasionally.) Because we eat so many beans, rice, and veggies the rest of the time, the cost of buying healthy meat in alignment with our values and health requirements has actually gone down. Smart Chicken also does not add water which all other companies do (unless you are buying a local chicken from the farm), which means you are not paying for added water, which also often has chemicals added to it. They don’t give you the wing tips, giblets, or necks — which MOST people don’t want — so you are not paying for that either. The birds don’t come stuffed with extra fat. The point of this is that the chicken is actually well-priced! factory farms do, which is the way it ought to be, and that is healthier for you. We use all the leftover drippings in our bean dishes because the birds are not so fatty! The flesh is firmer, as if the bird has truly run around, but not tough at all. All the Smart Chicken is non-GMO, no hormones, and no fed antibiotics. 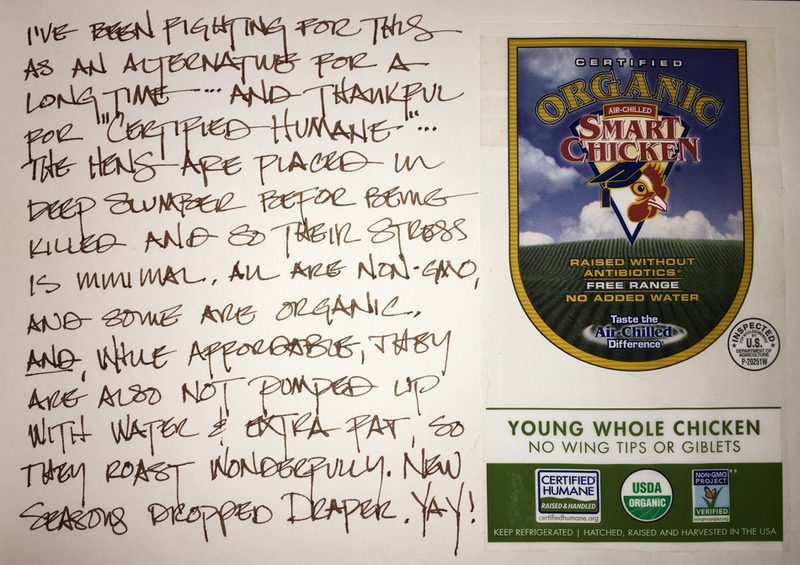 Organic is optional... and we feel okay about eating their non-organic chickens. Smart Chickens are raised where they are killed, and are used to their handlers. is slowly removed from the room, so they basically fall asleep without stress or fear. Once asleep, they are slaughtered. No fear kills. You can find out who carries Smart Chicken in your area here. but Niman Ranch‘s sausages, ham, bacon, etc. no hormones, and not fed antibiotics. treat for us for breakfast! Niman Ranch in your area here. Da Vinci,Holbein, MGraham, DS Primatek, and Daniel Smith Watercolors. 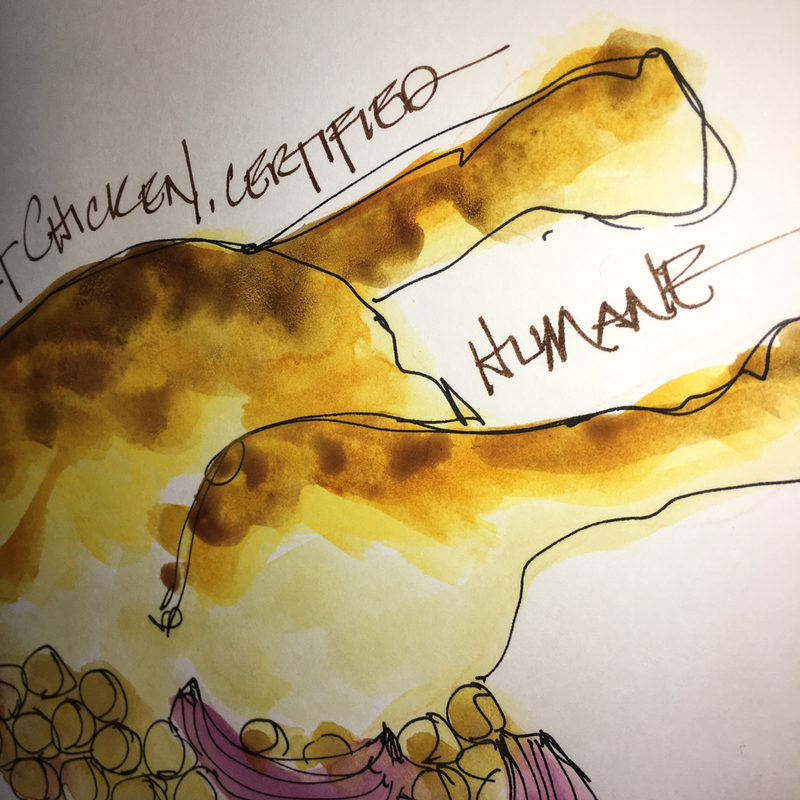 This entry was posted in art journal, drawing, ink painting, journal, painting, pen & ink, review, sketchbook, watercolor, writing and tagged #certifiedhumane, #hormonefree, #newseasons, #nimanranch, #noantibiotics, #nongmo, #smartchicken, art journal, Certified Humane, Daniel Smith watercolors, De Atramentis Tobacco ink, Holbein, Lamy LX, Niman Ranch, organic, Platinum Carbon pen, Primatek, Sennelier, Smart Chicken, watercolor. Bookmark the permalink. Katie, I have a few local vendors who raise organic meats humanely. I almost exclusively buy from them, but I’ll keep an eye out if Niman Ranch meats come to Wisconsin. I like having options! We do too, but we can’t get them year round. The thing is, I think they taste better too… more like when I was a kid!